Property 3: Spacious villa in a landscaped garden park on the outskirts of a small village. Property 10: Beautifully renovated gite with a private pool surrounded by vineyards. 4* Manoir in 98 acres, with private pool. Paradise! Property 12: 4* Manoir in 98 acres, with private pool. Paradise! Property 18: Spacious comfortable Villa in a big park garden close to the Dordogne. Property 23: Rural setting, wonderful view, fabulous swimming pool and lot's of privacy! Property 43: Villa with studio, large garden and private swimming pool. Old wine chateau with all comfort overlooking the vineyards of Saint-Emillion. 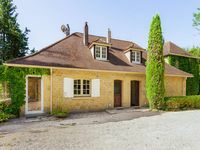 Property 47: Old wine chateau with all comfort overlooking the vineyards of Saint-Emillion. We enjoyed a week in this beautiful house, everything was excellent and extremely clean, kitchen well equipped, pool is wonderful and the beds are very comfortable! The house is in a great quiet area, very easy to get everywhere in the area, Bordeaux city center is 15 min drive from the house. We were a group of 4 and we all can highly recommend to book it for your next vacation! Beautiful, extensive gardens, situated at the edge of a village with a bakers and small grocery shop.